Long-term efforts to build sustainable city-regions are rooted in attempts to slow down sprawl by building more compact communities that can be served effectively by transit. Two of Canada's largest and fastest-growing city-regions, Metro Vancouver and the Greater Toronto and Hamilton Area (GTHA), have ambitious long-term plans that aim to do exactly that. Both share similar planning goals and have used similar policy mechanisms to combat sprawl, achieve a more compact form, and focus transit-oriented development around urban centres. These two city-regions differ, however, in the timing of their plans and their approach to implementation and monitoring. Together they make an interesting case for comparison. A 2010 Neptis report first compared the growth patterns of these two city-regions between 1991 and 2001 and found that the key to success in the Vancouver region lay in its consistent approach to policy that has survived changes in government and the collapse and reformation of its regional planning program (Taylor and Burchfield 2010). But a consistent approach to policy-making does not mean that a plan cannot evolve. Success in the long term requires policy refinement based on emerging trends that are measured and tracked over time against the goals of the plan. This current Neptis research extends the study to 2011. This comparison of how the two regions have grown over a 20-year period is timely, as both jurisdictions are reviewing their respective land use and transportation plans. Metro Vancouver had a head start on growth management relative to the Greater Toronto and Hamilton Area. Starting in the 1970s, British Columbia put in place strong protections for agricultural land with its Agricultural Land Reserve. But it is a consistent and long-standing approach to urban containment, to prevent growth from spilling into the countryside, that has produced results, including a reduction in the amount of land used for urban expansion and a greater diversity of housing stock. In recent years, Metro Vancouver has taken a more strategic approach to growth management, directing intensifi cation to frequent transit corridors and urban centres. Success in the long term requires policy refinement based on emerging trends that are measured and tracked over time against the goals of the plan. Ontario's growth management effort began in 2006, and like British Columbia, it has strong protections for agricultural land in southern Ontario. However, its plan takes a more generalized approach to intensification: 40% of new residential development is directed to the already urbanized area. In addition, a complementary greenfield target was introduced that was meant to increase densities in new development at the urban edge. As this report's findings show, growth in the GTHA is still tilted towards greenfield development. Ontario could learn from Metro Vancouver, by introducing a more strategic approach to growth that directs more new residents to areas with frequent transit service. Three important differences in the way growth has been accommodated in the Vancouver and Toronto regions offer a reality check and possible guidance for the regions' policy reviews at this critical juncture. 1. The GTHA is losing population in some established urban areas while growing mostly through greenfield development; Metro Vancouver is intensifying. Between 2001 and 2011, Metro Vancouver continued to accommodate most population growth through intensification, while the GTHA continued to accommodate the majority of new population growth through greenfield development. * Despite a condo boom in parts of downtown Toronto, in the Greater Toronto and Hamilton Area as a whole, only 14% of net new residents were accommodated through the intensification of existing urban areas. In other words, 86% of the net new residents added between 2001 and 2011 were housed in new suburban subdivisions built on greenfield sites. * By contrast, 69% of net new residents were accommodated in existing urban areas through intensification in the same period in Metro Vancouver. * In both city-regions, intensification accommodated a greater number of dwellings than people; 46% of net new dwellings were accommodated in the existing urban area of the GTHA and 76% of net new dwellings were accommodated in the existing area of Metro Vancouver. The established urban areas across Metro Vancouver have not seen anything like the population loss apparent in the Greater Toronto and Hamilton Area. Our research also found that new greenfield development in the GTHA was being built at higher densities than in the 1990s, as the rate of urban expansion slowed down while the rate of population increase stayed the same. Between 1991 and 2001, the urban area of the GTHA grew by 26%; it grew by only 10% between 2001 and 2011. One definition of urban sprawl is that the increase in urban expansion is greater than the increase in population (Fulton et al. 2001). By this measure, the GTHA is no longer sprawling. However, neighbourhoods in the older established urban areas of the GTHA are losing population, from Hamilton to Brampton to central Toronto to Oshawa. A striking example can be found in the suburb of Brampton. While Brampton gained more than 200,000 new residents through greenfield development, it experienced a net loss of population in its existing urban area. The loss signals changing demographics that need to be considered. As the suburban municipalities in the GTHA mature, there is a need to understand the internal dynamics of each municipality as it plans for future growth. By comparison, the established urban areas across Metro Vancouver have not seen anything like the population loss apparent in the GTHA. The GTHA experienced population loss in some inner and outer suburbs in both the City of Toronto and other municipalities, with intensification focused mostly in a few urban centres. In Vancouver, intensification was more evenly spread throughout the whole urban area. In terms of overall growth, the urban area of Metro Vancouver increased by 16% between 1991 and 2001, and by a mere 4% between 2001 and 2011, while population increased by 24% in the first decade and 16% in the second. Existing urban areas already have a range of services and infrastructure, from schools to sewer pipes. But in many of these areas, population has declined and these services and facilities are underused, while new residents are accommodated in greenfield developments that require new infrastructure and services. Furthermore, in both city-regions, the housing stock grew at a faster rate than the population. This finding is consistent with long-term demographic trends showing that the size of Canadian households has been shrinking and the proportion of one-person households has been increasing. We refer to this finding as "running hard to stand still," meaning that we are building more housing to accommodate the same or less population. 2. Growth in the GTHA is going to areas without transit; Metro Vancouver is achieving transit-oriented development. * Very little of the GTHA's population growth was located near frequent transit corridors or near GO train stations. Only 18% of the region's net new residents were accommodated near frequent transit routes, and only 10% of net new residents were accommodated within 1000 metres of a GO station. * In Metro Vancouver, almost 50% of the region's net new population was accommodated near a frequent transit route and 23% of new residents were accommodated within 800 metres of a SkyTrain Station. Although the plans for both city-regions contain transitoriented development policies, only Metro Vancouver's regional growth strategy directly integrates with its longrange regional transportation plan. An example is the adoption of the Frequent Transit Development Area policy in the 2011 strategy, which directs growth to corridors that are or will be served by frequent transit, as defined by TransLink, Metro Vancouver's regional transit agency. In the GTHA, land use planning and transportation planning appear to be on separate tracks. Municipalities began planning in conformity with the Growth Plan in 2006, two years before the release of The Big Move, the regional transportation plan. As a result, there was less focus on accommodating growth around corridors and centres with existing or planned frequent transit service. * In the Greater Toronto and Hamilton Area, Urban Growth Centres accounted for about 13% of the region's net growth in population between 2001 and 2011. * In Metro Vancouver, Urban Centres accommodated 28% of the population growth. This analysis suggests that Metro Vancouver's more directed and strategic intensification may be more effective than the Ontario Growth Plan's generalized requirement that 40% of all housing development occur in the form of intensification, a policy that does not direct intensification to locations in which it would have the greatest benefit. The Growth Plan policy is premised on the assumption that intensification--no matter where it is located--will contribute to reduced congestion, the efficient use of infrastructure, and more sustainable communities. This research shows, however, that intensification alone may not achieve these goals, especially in the context of declining household sizes. 3. The GTHA offers a limited range of housing choices; Metro Vancouver has created a more balanced housing stock over the past 20 years. In the GTHA, between 2001 and 2011 almost 86% of net new residents were accommodated in dwellings built on greenfields. Most were single detached houses (62%). In fact, over a 20-year period (1991-2011), the proportional composition of the GTHA's housing stock has remained unchanged. In Metro Vancouver, by comparison, the housing stock has been transformed from one dominated by single detached homes to a more balanced stock offering residents a greater choice of housing types across the region. Housing affordability is a problem in both regions. However, increasing the range of housing options is an important component of any policy to address housing price increases. 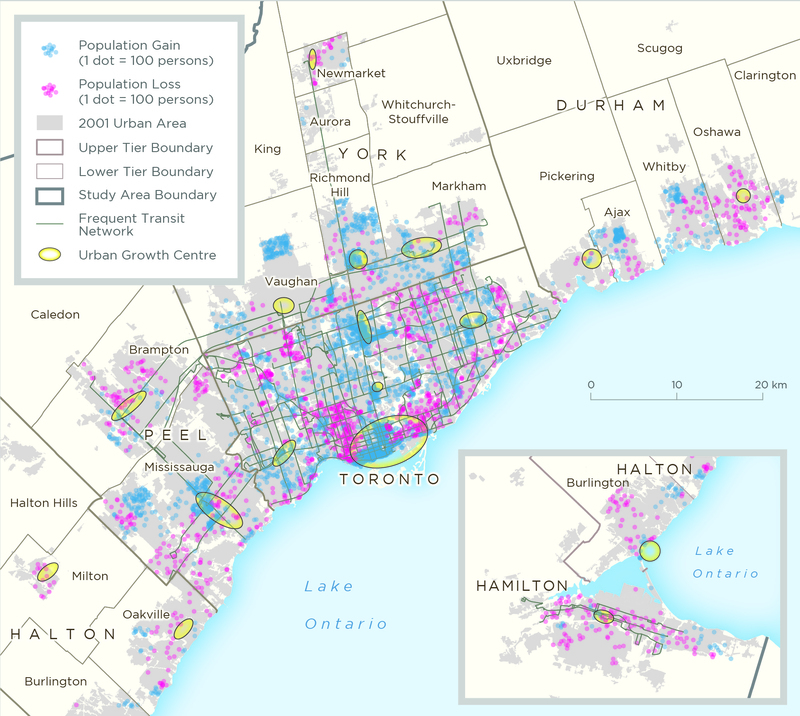 In the GTHA, Urban Growth Centres accounted for about 13% of the region's population growth. In Metro Vancouver urban centres accommodated 28% of the population growth. Three policy lessons arise from our study of the two city-regions. 1. A hard urban boundary and a clear regional structure can support growth management. In Metro Vancouver, a defined Urban Containment Boundary acts as a brake on outward development. Within that boundary, growth is targeted to urban centres, which are organized into a hierarchy according to their regional and local roles, and to areas served by the frequent transit network. Ontario's Greater Golden Horseshoe has no such hard boundary. Instead there is a requirement for 40% of housing development to go to built-up areas and for greenfield development to be built at a certain density within an Urban Settlement Area. The settlement area is not delineated in the Growth Plan itself and is therefore not a hard edge. 2. Planning for land use and for transportation should be coordinated. Both regions have transit-oriented development policies, but only Metro Vancouver's regional growth strategy directly integrates with its long-range regional transportation plan. In the Toronto region, there is a lack of integration between the Growth Plan and the regional transportation plan The Big Move, partly because the creation of a regional transportation agency and a long-range transportation plan came after the introduction of the Growth Plan. Neither plan attempts to direct a certain percentage of growth to particular transit-accessible locations across the region. 3. Support for regional growth management calls for cooperation and monitoring. Metro Vancouver is a regional body that coordinates services across municipalities in the Vancouver region. It acts as a convener of local stakeholders and municipalities, all of which have to buy into the regional growth strategy. The role of convener is important in the success of the strategy, to ensure that local interests do not trump the regional perspective. The Growth Plan for the Greater Golden Horseshoe does not have any similar structure for reconciling the needs of individual municipalities and the region as a whole. Implementation is carried out by individual municipalities and there is no requirement that these municipalities work together or consider regional priorities in their decisions. Metro Vancouver also has a well-established monitoring program that tracks 55 indicators relating to land use, the environment, and the economy. In the Greater Golden Horseshoe, the Ontario Growth Secretariat has only recently established 14 indicators to monitor the effectiveness of the Growth Plan. Although the monitoring program for the Greater Golden Horseshoe is too new to have produced results, it is starting from a less robust foundation. It is hoped that this research, analysis, and commentary will provide evidence of new population and housing patterns, particularly in the GTHA. As part of its 10-year review, the Province of Ontario should consider these patterns as it evaluates current policies in the Growth Plan. The GTHA is no longer "sprawling" according to the traditional definition of this term. However, the problems associated with "sprawl" remain, since the majority of the new population is being accommodated in automobile-dependent neighbourhoods. While the GTHA is no longer sprawling, the problems of sprawl remain.